By car or coach: New Lanark, by Lanark, is around an hour's drive from Glasgow (25 miles/40 kms) or Edinburgh (35 miles/56 Kms) and is well sign-posted from all major routes. 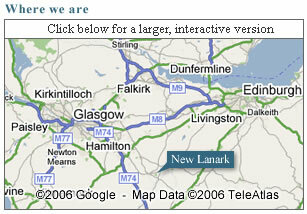 By bus: There is a bus service between Buchanan Bus Station in Glasgow and Lanark. Details of this service are available here or phone Irvine's Coaches on 01698 372452. Please note this service does not run on a Sunday.